Alone on stage, and bathed in green light, Chicago rapper Serengeti drinks red wine and steps up to the mike. 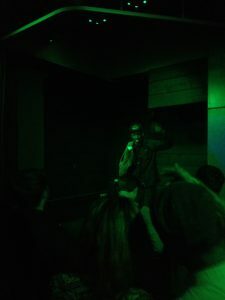 In an engaging and witty set, we are treated to a number of tracks from 2011’s Family & Friends, including The Whip, an ode to a failed UFC fighter, and California, about the post-career reinvention of a rapper in the Golden State. Serengeti has forged a prolific career from explorations of fictional characters, most notably the almost-famous 1990s rapper Kenny Dennis or KDz, who has a large moustache, a heavy Chicago accent and a fragile ego. Kenny was introduced to us in the 2006 track Dennehy, a crowd favourite played twice tonight by popular request. His most recent outing was 2014’s Kenny Dennis III which tells the story of the rise and fall of his mall-circuit rap outfit Perfecto, and is represented tonight by the track No Beginner (hot dog for lunch/ hot dog for dinner/ don’t eat breakfast/ I am no beginner). We are told that Kenny’s tale is over now, but that new material has been written by Kenny’s wife Tanya T, with heavily 80s flavoured beats. Serengeti’s alliterative side project with Son Lux and Sufjan Stevens, Sisyphus, is also represented by a rendition of Rhythm of Devotion (at the start, we’re told we can dance now. The crowd stays mostly still though, prompting Serengeti to remark ‘usually people dance to that track, but you guys look cool’). A great, but all too short, set.